Are you looking for a free interior painting estimate? If so, consider this. Lots of folks call themselves a professional interior painter. However, many of those people are not truly professional painters. Many of them just don't have the necessary experience to produce a first rate painting finish. A large number of them are accustomed to painting empty apartments in high volume, while often sacrificing quality, preparation, and precision. Unfortunately, those methods usually result in paint all over the place. That could mean paint on your floor, your door, or on your precious antique furniture. Fortunately for you, Clinton Painting Services has the ability and dedication to provide you with a custom painting service that is second to none. Whether it's a mansion, a ranch, a split level, or a condominium, we paint them all in a precise and careful manner. The owner of Clinton Painting Services is truly a professional painter, who has many years of experience beautifying interiors for customers just like you. He's learned to take the time to do the little things to make sure the job is done right, and makes certain anyone working with him does so. too. The extra protection we offer begins with always using the appropriate drops cloths and plastic sheeting to ensure the paint goes where it should be. Once the home has been protected properly, the real work begins. When you chose to hire Clinton Painting Services for your interior painting project, our team resurfaces defects and prepares all of the surface that are to be painted. After the surfaces in question have received the proper preparation, and only then, is a single drop of paint applied. Using this approach allows us to achieve a premium paint finish that will stand the test of time. Once the preparations are completed, we use the best brushes and rollers that money can buy to apply the perfect amount of paint. Our team methodically hand paints each surface in turn, until the all tasks are complete. Don't take chances when it comes to beautifying the inside of your home. Contact us for a free interior painting estimate at (336)215-4128 when you want the job done right. "We had Robert Clinton and his team paint three rooms in our 1920s bungalow. He and his team were considerate, responsive to our needs, and professional. They finished on time and did a wonderful job, especially considering the colors they were covering--a very dark brown in the master bedroom and a bright orange in the office. 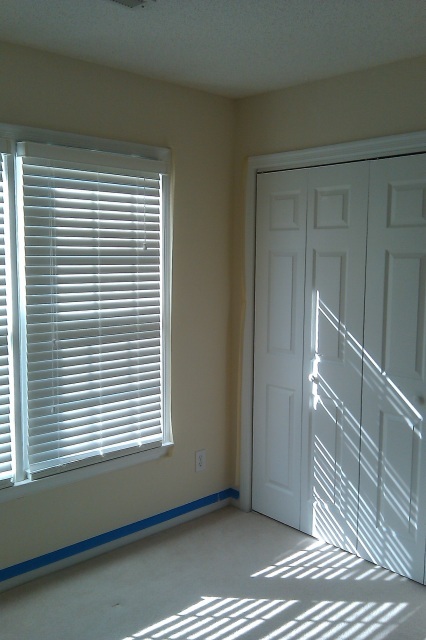 We love the results and would recommend Mr. Clinton to anyone looking for a painter." Fill in the form below for a free estimate!